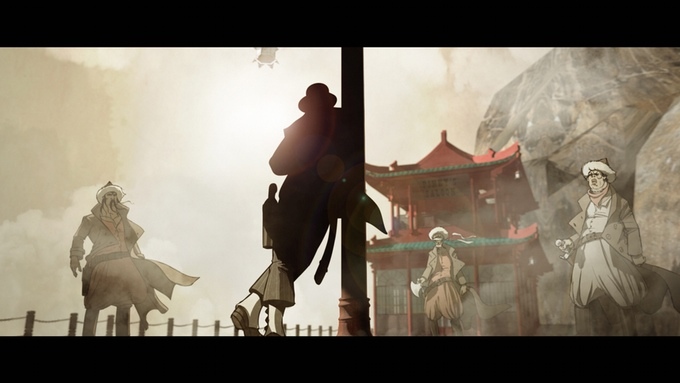 This time we’re showcasing something a little different on “Kickstart the Week.” Orient City: Ronin & The Princess is a hand drawn animated film. This samurai spaghetti western features characteristics of the American Wild West combined with the architecture of Feudal Asia. Orient City is built on top of four rocks connected by the channels of water at their base. The poorest citizens live at the bottom while the highest class lives without a care at the top. There is no electricity in the city, making coal is the most valuable commodity. Gunpowder is also a rarity, meaning weapons usually only fire one shot. This is why blades are the weapon of choice. The Kickstarter for Orient City lists detailed biographies of the two men I will be interviewing today: Zsombor Huszka (Saint Chaos, R.E.M.) and Ryan Colucci (R.E.M., Harbor Moon). The short needs about 6,000 frames. Huszka will draw 1,000 key-frames and set the colors for each sequence while additional colorists and in-between characters animator will be doing the other 5,000 frames. The rest of the process includes background rendering/painting, voice recording, key-frame animation, in-between animation, ambience building, visual effects, sound design and score. The Kickstarter for Orient City will end on June 2, 2016 at 2:59 PM EDT. Colucci is trying to raise at least $30,000. If you pledge $10 you will get a digital download of the film (1080p) and for $15 you will get a DVD copy. Other rewards include t-shirts, movie posters and art prints. Pledge money to the project here. 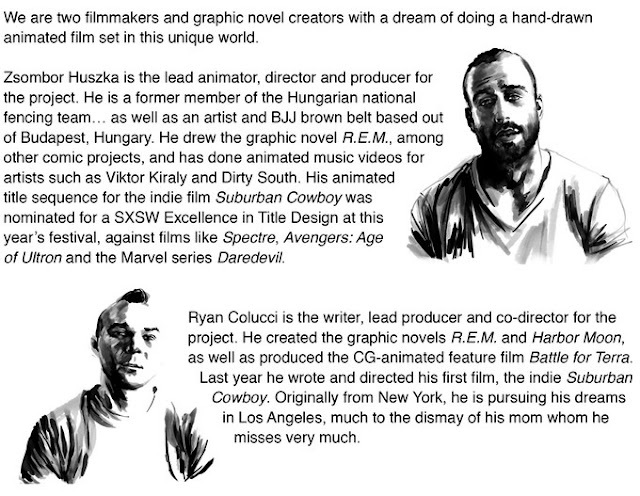 I spoke with lead animator, director and producer Zsombor Huszka as well as writer, lead producer and co-director Ryan Colucci. Me: How did you come up with the idea of creating a setting that combines the American Wild West with the architecture of Feudal Asia? Zsombor Huszka: Two worlds that I just love. Probably the work of Quentin Tarantino inspired it the most. I have always loved how he picks a genre or a type of movie and lifts all its elements into his movies. Then he exaggerates everything, even its flaws. And western movies just reek of schemes that are begging to be exaggerated. On the other hand, as far back as I can remember, I was always drawn to Asian martial arts and the culture around them. I have vivid memories of drawing ninjas at a very young age. My subconscious most likely mixed these two together. I used to fence for the Hungarian national team, so I took my love for sword fighting quite literally. 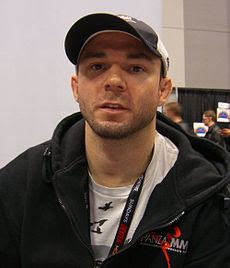 And I still train jiu-jitsu every day. 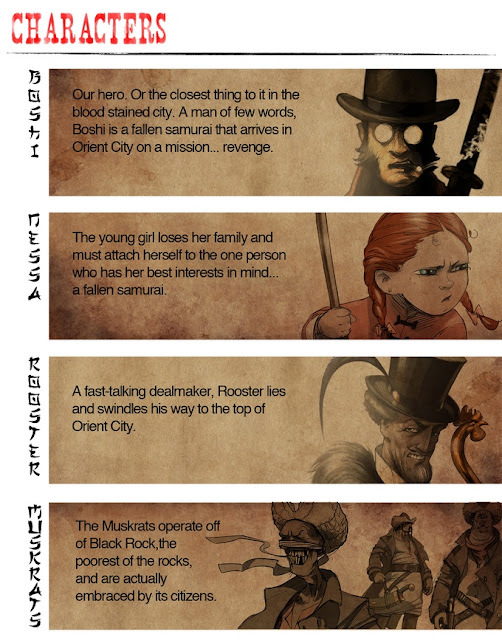 Me: If you had to pick, who is your favorite character in Orient City and why are they your favorite? 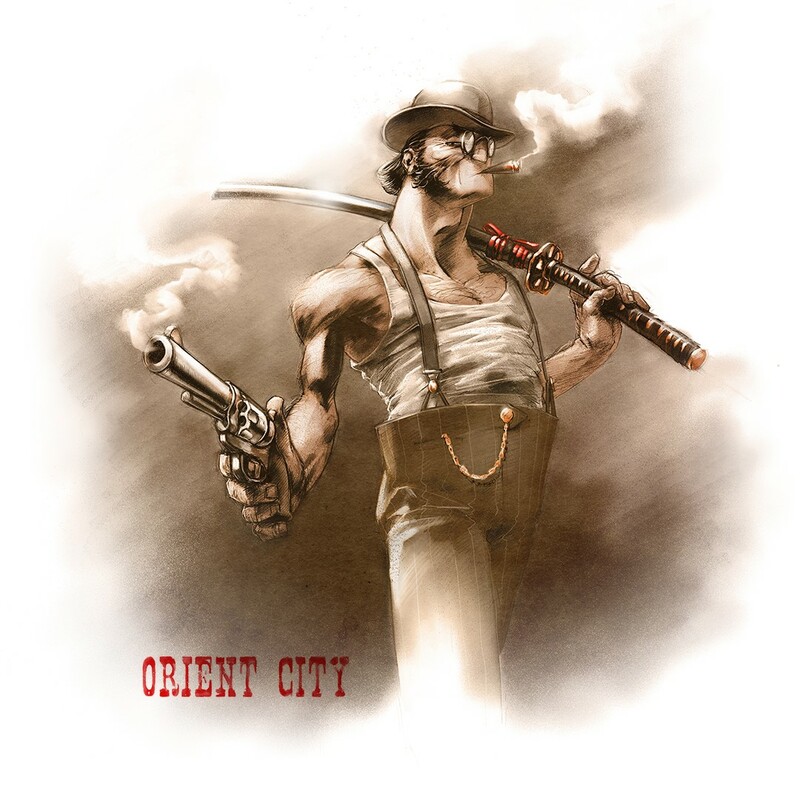 Huszka: Obviously Boshi is the original character of Orient City. He existed before we even came up with the idea of the film. This image was the one of a few that inspired us to go down this road. My other favorite would be Nessa. She is completely Ryan’s brain child. And I know his personal experience that made him create her. 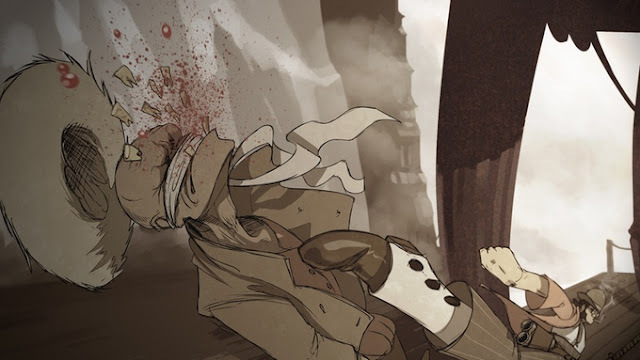 I think her character and her role in the movie is what separates Orient City from being just pointless blood splatter. Me: Why did you decide to make this a hand drawn animation rather than a comic book? Huszka: Ryan and I are both huge fans of high-quality animated movies. It was always my childhood dream to make animation, or cartoons. I can’t give you a specific reason why, but when we started brainstorming this project we both assumed it was going to be 2D animation from the very beginning. However, we do plan on turning this to a comic if we reached a certain stretch goal in the Kickstarter campaign. Me: The Kickstarter mentions you can do roughly 20 key-frames per day. What is the process of creating a key-frame like? Huszka: I think about the choreography of a motion in my head and I break it down to key moments. I capture those moments and sketch them down. Then I clean up those sketches into line arts. Then I add a shadow and shade layer, then a color layer. There are other steps that give my characters a final look, but those are my little secrets. The key to doing that many frames per day possible is that my sketches and line arts are pretty close to each other. I like to keep some level of sketchiness in my line art. I think that is one of the aspects that defines my style. Me: What is the number one reason you think people should back Orient City? Huszka: In my mind people look at it and think: “Holly sh*t! I want to see this movie!” As simple as that. It doesn’t have any other purpose but entertainment. Of course, to me it means much more. But I can’t expect other people to pledge for that reason. If someone won’t get excited by an idea of a samurai western but they can appreciate a work of art, I can promise them that I will do my best to make every single frame a piece of art that one would want to hang on their wall. Me: What advice do you have for people trying to break into comics? Huszka: Well, I don’t consider myself someone who has broken into the industry. I still have a long way to go. But for anyone on basically any field I would say find your passion and practice it diligently. Work hard and always find your happiness in it. Sometimes it may not be enough, but that is all you can do. Specifically for the comic industry I would say look for any smaller opportunities at first. They might lead to something great and they make your resume longer. Many people think breaking into the industry is sending your submissions to DC or Marvel and they will buy your idea or just have you draw Batman. It could happen, but there are many people out there looking to collaborate with a great artist… I found Ryan like this and now we’re making an animated film together. Me: What advice do you have for animators? Huszka: In this kind of art you have to put many hours of labor in before you even see the tiniest result. It can be break you down sometimes. Patience is everything for an animator. But when you see your character come to life, you forget all the struggle you went through. Me: How would you describe the protagonists of Orient City? Ryan Colucci: Troubled. These are people who are rough around the edges. This is a world built on violence, bloodshed and corruption. Even the best of them are still extremely flawed. Colucci: Boshi. He is our hero, or closest thing to it. I grew up on spaghetti westerns, and the heroes of those were characters that lived by a code – but their own code. It wouldn’t fit in today’s politically correct universe. I love that. Guys like Harmonica and Blondie, who don’t speak often, but when they do it means something. Who are faster with a trigger than their mouth. That is Boshi. At some point he was a proud samurai, but when we start he is wasting away in an opium den – a disgraced ronin. Our hero has cold sweats and the shakes and isn’t fond of conversation. To say he is rough around the edges is an understatement. Me: How did you and Zsombor Huszka meet and start working together? Colucci: I was looking for an artist for the graphic novel R.E.M. and he applied. It will sound trite, but as soon as I saw his samples I needed to know more. He did a test page – which is pretty much what wound up in the book – and it has been no looking back. It’s hard to think about doing a project without him in some way. Even when I do a live action piece, he is involved. Whether it’s providing artwork that goes on the walls or doing animated titles… but this is the ultimate – an animated film together. Colucci: I just don’t know if they realize how epic this thing is going to be. We are not going to sleep until it is done, and we are going to pour every ounce of ourselves into this project. And who doesn’t love samurai westerns? Colucci: Patience. Anything that has to do with the arts, just be patient. What we do is not necessarily well paid – or paid at all. If this is truly what you want, you need to persevere. Trust your vision and don’t ever give up. 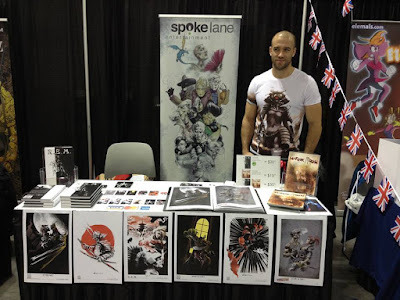 Specifically for comic book writers – you can’t expect anyone to hire you. If you really want this – go out and create a book. Find an artist and make it happen. Me: What advice do you have for aspiring directors? Colucci: I don’t know if I’m in a position to be giving life advice to directors as I just directed my first feature…. But… find the absolute best script you can do for the absolute least amount of money – then go make it. I had a lot of scripts… and after shopping each one to direct, would write another that was smaller. Until I eventually wrote one that I could actually do without having to beg and plead for money. We are all only aspiring until we actually do it. So just go do it. Me: Thank you for your time Zsombor and Ryan! 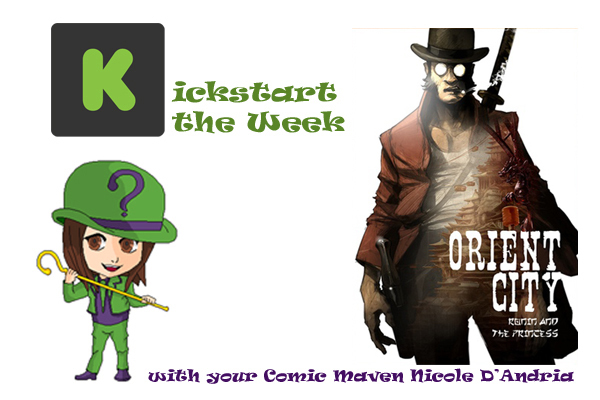 If you want to support their hand drawn animation, check out the official Kickstarter for Orient City.